Cinders is from the King Top Mountain HMA near Delta, UT not far from the Conger Mountains. She was foaled in 2000 and was gathered as an 8 month old in an emergency removal. There has not been a gather since. She was adopted out of the Ewing, IL corrals and was titled in OH The paper trail runs cold until she showed up at the Bastrop Kill Pen in 2016. Where was she for those other 14 years or so? We will most probably never know but she is home now, forever. Gabby is an 11 year old black most probably Quarter Horse mare with a white mark on her forehead. She has no other distinguishing marks or characteristics. She is a little head shy and although she has been trimmed by our farrier on the front, she would not allow her back feet touched, possibly an old injury or fear. She is quite friendly with other horses but a bit shy of humans although its clear she wants to trust. She was purchased by Cascade Stables in uptown New Orleans to be used as a parade horse for the 2017 Mardi Gras. After the festivities she would go back to the broker she was purchased from and most probably ship to slaughter in Mexico. The Humane Society of Louisiana stepped in to make sure these ‘parade horses’ would not go to slaughter and worked tirelessly to get each one adopted to approved homes. When I saw Gabby I knew she was going to come to our sanctuary and retire, and indeed she did. She is settling in and learning what it means to have food, companionship and love. Gabby has no history that we can find prior to her purchase by Cascade Stables for Mardi Gras. Her coggins was pulled on 1.31.2017. We know she was purchased prior to that by the infamous kill buyer Anton Wald of Kenner, LA and was then run through Dominques’s Livestock Market in Opelousas, LA where she was purchased for Mardi Gras. Gabby’s history is vague but her future shines with hope! Cinder is headed for Oklahoma from quarantine at A&A Transport, I am beyond excited! I’m to meet Andrew Guidry, the hauler, at Dr. Radde’s vet clinic around 5 p.m.
As fate would have it Andrew got caught in traffic south of Ft. Worth, TX and will bring Cinder here, to Grey Oaks, even better, I get to have her here with me tonight! She arrived at dark, what a tiny little thing she is, so beat up, so thin, so absolutely loveable. We walked her down to the barn to get her settled in for the night. She loves her alfalfa and ate her pellets. A few small alfalfa cubes and a large flake of hay for the night. She wasn’t overly thirsty so that meant she had been kept well hydrated on her journey. When everyone left it was just me and Cinder, I told her that she would live the rest of her life here in luxury. The very last thing I did that night was cut off that long mane, at one time it must have been gorgeous, not any more. It smelled ‘kill pen’ there was no amount of washing, brushing, conditioner or combing was ever going to make it beautiful again. I cut it down to 4 inches and threw the rest in the trash. That was her past, she would grow another luxurious mane one day and that would be part of her future. She looks quite snazzy with her punk rocker type mane trim. Cinder has spent much of her time eating, resting and getting to know the members of our little herdlet. She must have had a buddy at one time because she has fallen in love with our little buckskin mare, Abby. The sentiment is not mutual but Abby puts up with Cinder to a point and then it’s back off. Abby is very spoiled and is used to being the only mare in the barn and of course a favorite of mine, but it will work out in time. Cinder also likes another Mustang that lives here, a gelding named Sky. He tolerates Cinder pretty well so all is good so far. I gave her a Betadine bath, brush her daily, add fly spray when necessary and her coat is starting to have a shine. Her weight is the same but she’s not been here long. The most exciting news so far is her trip to the vet. Cinder is only around 15 years old, has a sound heart and lungs, her teeth are bad because of non-existent care in her past. She was given her vaccinations, de-wormed and back home we went. Monday she will get a much needed hoof trim, hopefully her teeth floated and she will be ready to enjoy the rest of her life in comfort. I only wish that was the case for the others that were left behind. Later that evening I was sent the most heart wrenching photographs of a very small Mustang mare clinging to life for all she was worth. She was not only beaten up it looked like she had either been drug or fallen in a trailer, she had skin literally falling off her legs. I was told that even after all she’d been through she was a loving, gentle little girl, although depressed and defeated. When the vet was able to come out and examine Cinder we received a surprise, Cinder was most probably in the flood at Baton Rouge, is why her skin was sloughing off her legs from the filthy water she was forced to stand in. Vet also aged her at about twenty five years old, yet the Coggins from the kill pen put her birth date down as 1980 which would make her thirty five years old. The truth most probably lies somewhere in between. Cinder is too congested and fragile to make the trip to me this week, we are hoping she will be stronger next week so I can start spoiling her. She loves her hay but won’t eat grain. She either was never fed grain or she just hasn’t the taste for it, either way she will always have food in front of her. She is more alert and whinnies when she sees Ashley. She received a medicated bath, antibiotics and lots of good old fashioned care and love. She fell asleep while being brushed her first night safe, possibly the first night in a very, very long time. Friday morning, September 23, 2016 I messaged Ashley to check on Cinder and found out she is starting to eat a little bit of grain, is even more alert and her coat is starting to have a hint of a shine to it. Needless to say I was overjoyed! My little Cinder would enjoy the rest of her life after all. I was also informed she was ready for travel and would be arriving either Tuesday or Wednesday! My trailer is ready, they will transport her to my vet for evaluation, I will then take her home to the comfort she always deserved. This morning, September 14, 2016, sitting with my coffee looking at Facebook, news, and e-mail which is my custom I happened to see a little Mustang mare at the Bastrop Kill Pen in Louisiana. Usually I can scroll on past thinking what a horrific place to send a horse. I looked again, this little mare was limping, dirty, scrapes and abrasions over most of her body and a cut over her left eye that was clearly swollen and infected. A once luxurious, flowing mane matted, so thick with filth it didn’t even move as a mane should. This little one would not get bail, she was too thin, probably too old and not flashy in the least. She would ship to slaughter crammed in a semi trailer with many more poor souls and more than likely not even survive the trip. How can someone throw her away like so much trash? How many auctions was she run through before she arrived at the kill lot, or was there just one, the one that no one bid on her except the kill buyer. I hope she was loved at least once in her life, maybe when she was first adopted her new owner had grand plans for her. I wonder what happened when one day someone looked at her and didn’t care anymore. I kept watching the video of her, over and over, reading comments like she looks so sad and someone please save her. One comment said she needed her feet done, amazing how a person can look at this emaciated little mare and only see that she needs a farrier. No one was going to bail her, she would ship to slaughter. My stomach starting turning over, this little mare was not shipping to Mexico, she was coming home to me, to Grey Oaks Equine Sanctuary to live the rest of what life she had left in comfort. With the help of a friend I was able to make her bail, she was mine, but now I had to find a way to transport her from the middle of Louisiana to southern Oklahoma. She would be moved to quarantine at the kill pen until transport could be arranged at the tune of eighteen dollars a day. Her care would be marginal at best. I starting calling transport companies that regularly went to Bastrop Kill Pen to haul rescued horses, some were fairly reasonable, some extremely high. I got the distinct impression that since this little mare was a Mustang and not a pedigreed TB or QH she wasn’t going to get the attention she deserved. One hauler even told me she’d never make it out of quarantine, advice I didn’t need or want. Then after calling twice I found A&A Transport out of Washington, LA initially they had told me they just didn’t have room for her on the truck the next day and it would just be too long for her to wait. When I accidentally called them a second time thinking this was one I hadn’t called, I was frantic to get her to safety, Ashley told me she had thought about it and if there was any room at all on the truck they would pick her up the next day. Needless to say I was beyond thrilled my little girl may be getting out of that place. I was on pins and needles the next day until Ashley called in the afternoon and told me she was on her truck headed to quarantine! She would receive food, water, vet care and most importantly some degree of love and affection. As you know from a previous post the sanctuary adopted Gabby and Eli, they have been at their foster home for less than a week and the change in them is remarkable. They are now what is known as Pasture Puffs. n. Gloss: a horse or other animal that has been retired from a working life. Because of the many people who saw the potential in a couple of older horses and donated to their transport expenses, Eli and Gabby will continue to learn how to be ‘pasture puffs’ I think they are fast learners. In February we adopted two Mardi Gras Parade Horses, Gabby and Eli. They were being offered by the Humane Society of Louisiana after their tour as parade horses was done. We saw that they were both considered aged on their bios and had a smaller chance of being adopted than some of their younger counter-parts. We saw in both these horses a need for a soft place to fall and we decided we could be that place. Every year the parades at Mardi Gras need a set number of horses, many are leased from the stables around the city of New Orleans but when the need is greater than what these stables have to offer, they look for these horses elsewhere. Horse brokers are most probably the cheapest place to look for a horse that will be used and then discarded like so much trash. These people also go by the name ‘kill buyer.’ Many own kill lots and always have a surplus of horses because their business is to troll the auction houses looking for horses to buy, many times bidding against rescues and families, to fill their trucks heading to Mexico and slaughter. Although we will never know for certain, there is a good probability that both Eli and Gabby were purchased from a broker to parade at Mardi Gras and then when the celebrating was over, they would go back to the kill lot, if not adopted from there they would have boarded a truck headed to Mexico to be slaughtered, the meat sold to Europe and Asia where it is considered a delicacy. Because of the Humane Society of Louisiana, Gabby, Eli and many other parade horses are now safe, sound, and being well cared for and loved in their new adoptive homes. Gabby in particular is very thin and has saddle sores but there is a light, a spark, an inquisitiveness if you will, that lights her up somehow even after the way she has been treated. She is a survivor for sure, and with her good friend Eli by her side this girl is going to be healthy again, we promise. Eli, on the other hand has decent weight, not ideal but not emaciated either. He does have a sway back which is not always painful but he may have more going on, we’re not sure. Our vet will access both and give us a program for these two so they can feel better. We will keep updating their progress as they grow healthier. Moved to the Red River Valley of Oklahoma in August of 1989. I brought with me at that time, one horse. An aged Appaloosa mare named Teesa, she taught me a lot about horses and is the reason I still have horses today and have hopefully evolved into a good equine caretaker thus resulting in the formation of the sanctuary. Teesa was a trade-in. I had a 1969 Thunderbird with suicide doors that struck the fancy of one of hubby’s co-workers, I had always wanted a horse. We both decided it was the best deal ever made because we both thought we got the better end of the transaction. Teesa was a red roan Appaloosa mare that was ideal. She taught me how to think like a horse, how to be patient, kind, forgiving, and honest. She and I spent our days together at the new place, taking out old fencing, picking up discarded pig iron which there was a lot of and generally just hanging out together. When she got bored watching me work she would wander down to the south pasture and graze in the sun. There are many stories I could share about Teesa, and in future posts I may do just that. She was the cornerstone on what I base all horses, she was truly one in a million. Teesa and I were best friends forever for over 11 years, she succumbed to choke in the fall of 2000 and nothing could be done to save her. I miss her every day. Were animals of every sort, as healthy as could be! 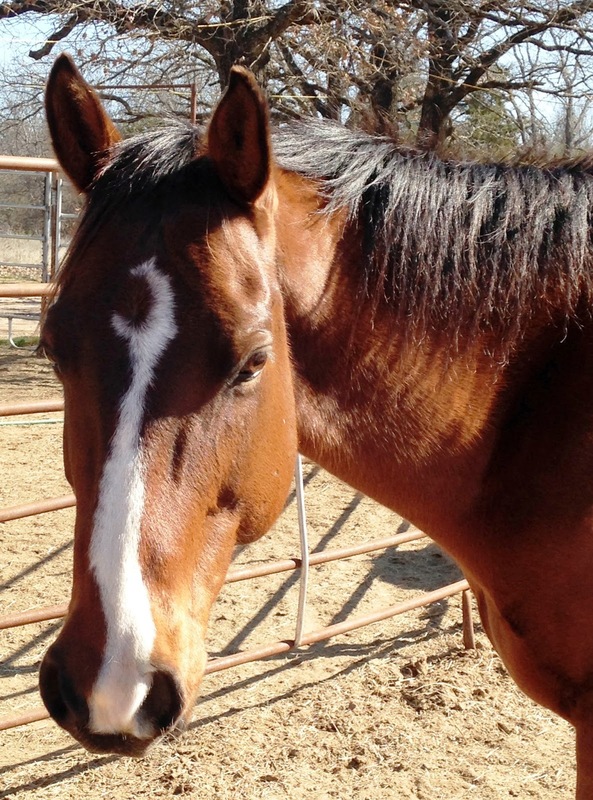 The sanctuary was contacted about Micco from a woman in Kansas that had purchased this gelding from an auction, once she got him home and really got a good look at him she realized he was not a barrel prospect. He was terrified of people and needed a quiet place to regain what the auction pipeline had taken from him. He is a registered Quarter Horse by the name of Shadow’s Cattleman foaled May 17th, 2005 in Burden, KS sold at the Double T Auction in El Dorado, KS for $50 in 2006. We drove to Kansas and picked up this frightened little one year old stallion and brought him to live at the sanctuary. Rohan, our little one-eyed 3 strikes Mustang took him under his wing and helped him adjust to this new world of quiet, peaceful pastures and kind and loving words. It took quite a bit of time for Micco to come around, if you tried to touch him he would shake as thought he had a motor attached somewhere. We just let him be a horse for a good 2 years or more. Nothing was asked of him and he grew to be one of the most loving, and kind horses you will ever have the pleasure of meeting.